It’s always amazing to stumble upon small companies doing great things – it’s even better when they’re located in the city you reside. And vegan too? That’s like rad on a whole ‘nother level. It’s basically the universe giving you a thumbs up. Monk’s Meats is a NYC-based purveyor of Seitan (and delicious vegan food in general); selling both wholesale and prepared foods (at spots like Smorgasbord & Vegan Shop Up etc). More than just being a great company with great product, they approach what they do with such a clear focus – it’s refreshing. They aren’t out to approximate the flavors of meat and pass it off as an analog; they’re just trying to make good, delicious, natural food – simply made. As Co-Owner Chris so efficiently stated in the following video featurette: “We don’t make fake meat – we make real food.” And to me that’s RAD – like 1980’s BMX move Rad – because that’s how I approach food. My thought process for this recipe was simple. 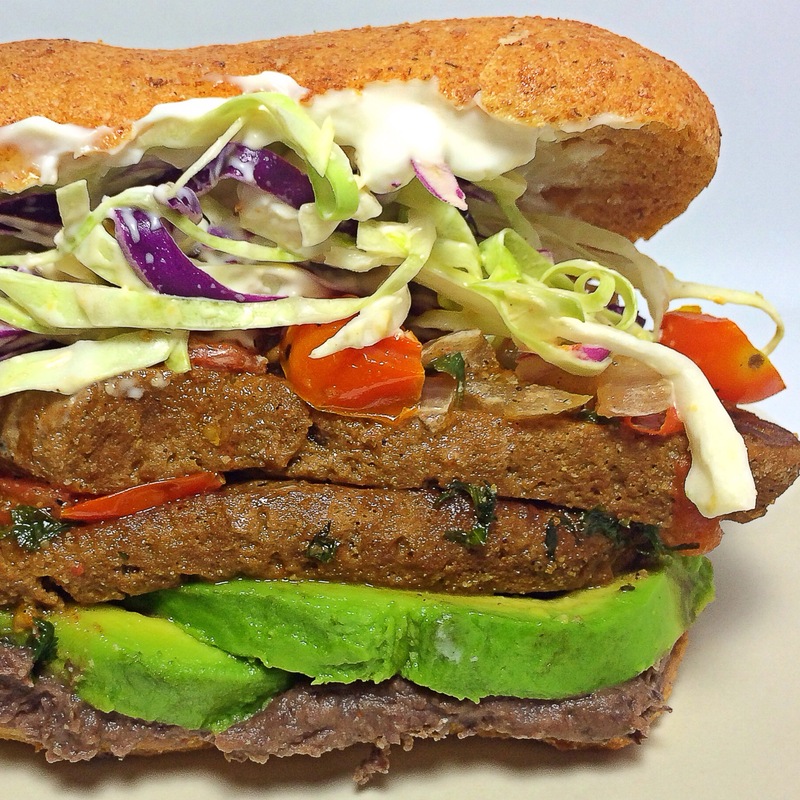 How can I make their Seitan the star while highlighting the Mexican flavors I so truly love and respect? Essentially, I wanted to play to their strengths as well as mine – without overdoing the integral flavors. And thus. This torta was born. But! 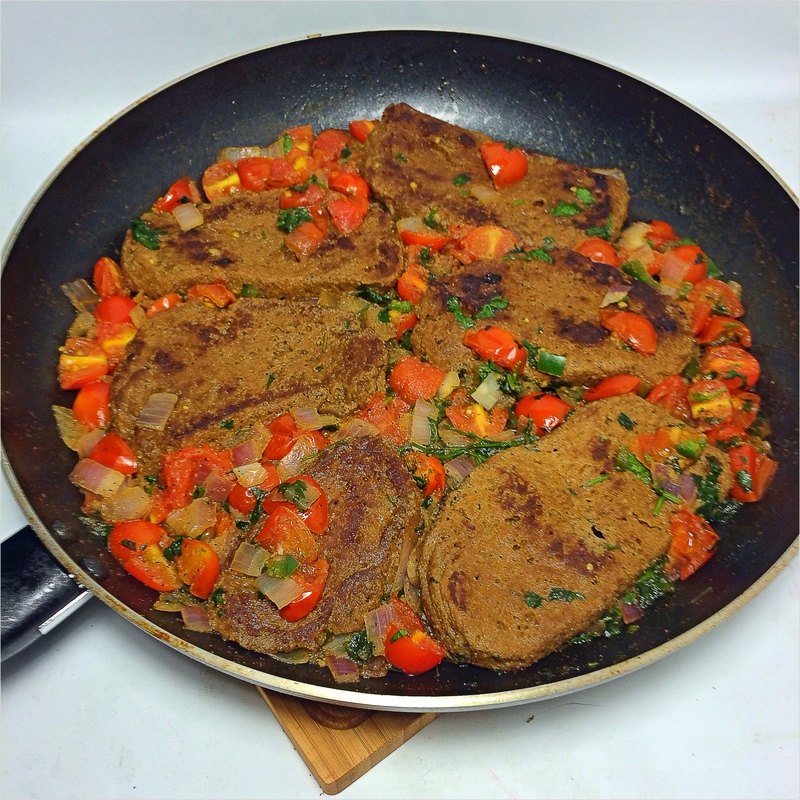 I also wanted a recipe that could translate itself to any Seitan that you like! But y’know if you’re able to order directly from Monk’s do that. (Information on where and how to acquire their goods will follow this post). 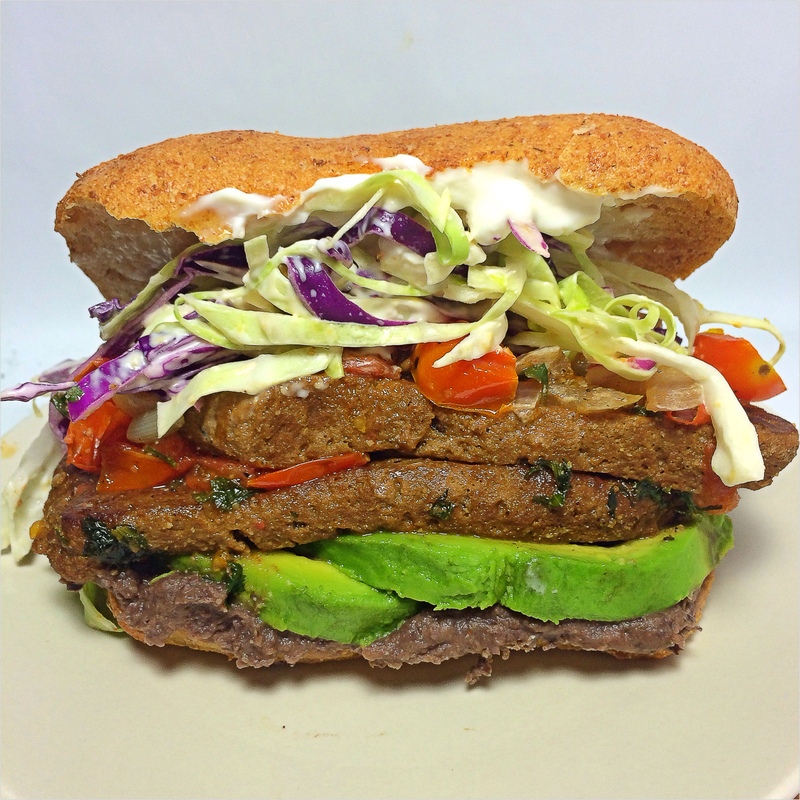 The Torta (sandwich) itself is comprised of four distinct layers – recipes for the components are below – they are as follows (Bottom to top) Bread, Black Beans, Avocado, Seitan, Cabbage Slaw, Vegenaise, Bread. 1. Heat Oil in a large saute pan over medium high heat. 2. Sear seitan in hot oil on each side(s). 2 minutes each side(s) or until you see a bit of char. 3. Meanwhile, whisk your broth mixture in a medium bowl or measuring cup. 4. To saute pan, add your tomatoes, onions, jalapeno and cilantro. Stir to incorporate. 5. Allow to cook for 3 minutes over (same) medium high heat. 6. Add your broth, cook for 1 minute then lower heat to low. 7. Cook until tomatoes have broken down a bit and (most) of the liquid has been cooked off. 1. Place all ingredients except vegetable broth into a food processor or blender and blend until fully incorporated. 2. With food processor (or blender) running slowly drizzle in your vegetable broth until you reach desired consistency. I use all 1/4 cup but you may deem that you need more or less. 3. Pour contents into a small pot and heat on low, stirring occasionally, until heated throughout. 2. Using a spoon or fork lightly toss all of the ingredients to incorporate evenly.3. Salt & Pepper to taste.How I Built My Torta or: How I Learned To Stop Worrying And Love The Mexican Sandwich. I started by slicing each roll length-wise, toasting them lightly and adding a good amount of bean mixture on the bottom and a TBS of Vegenaise to the top. From there I put 1/4 of the avocado (in slices) on top of the beans; followed by 1/4 of the Seitan (including some of the cooked tomatoes & onions). Topped off with Slaw and top of the bread.Then, I Attacked!!! Full Disclosure: I received no compensation for this post other than sample product. I was not obligated to do a post nor give Monks Meats a ‘good review’. I enjoy their product so this post / recipe is just a manifestation of that. Plus, I helped them make tamales last week and thought they were cool people.